Heat Stroke is a very real problem for horses as well as humans. As temperatures rise, please keep your stock's health in mind at all times. Heat stroke can occur not just when horses are working hard, but also when they are traveling in trailers or standing in stuffy stables or unshaded pastures. I'd like to include a simple list of things you can do to help avoid such an occurance. Provide ample fresh clean water, and make sure that all your stock can reach it; keep in mind that foals, ponies and donkeys have a difficult time reaching shallow water at the bottom of a tank. Ideally, clean and refill buckets or tanks daily. Try to ride only in the early morning or late evening when it is cooler; avoid riding during the heat of the day unless you have ample shade and plenty of rest and watering breaks. Also, loosen cinches whenever you do have a rest period. Always cool your horse down after a workout; don't just turn them loose in the pasture. Offer sips of cool water and walk the horse slowly. Muscles are more apt to stiffen if the horse is allowed to stand and moving muscles dissipate heat better than stationary ones. Use a wet sponge or hose down the large blood vessels with cold water along the inside of the legs, belly, and neck. Make sure that your stock is able to avoid the sun. There should be some sort of permanent shade available to them, such as a loafing shed, barn, or shade trees. If your stock is kept in a barn, use a fan for continuous air flow. Of course, make sure the horse can not reach the cord or fan itself, it can't be tipped over, and it cannot come in contact with water. Definitely use fly spray, sheets or fly masks. Horses can easily overheat in hot weather from pacing, stomping, kicking, and biting at flies. Use sunscreen anywhere that pink skin shows. Zinc oxide cream works well to prevent and treat sunburn. This may not prevent heat stroke, but it helps, and a sunburn is just as painful to horses as it is to humans. Elevated respiration in an inactive horse - When your horse is healthy, get a baseline count of breaths to minutes so that you have a number to compare against. Elevated pulse in an inactive horse, or pulse that does not drop after several minutes or climbs once exercise has stopped. Again, you should have a baseline measurement. Profuse sweating or no sweating at all. Elevated body temperature above 103F. Dehydration. Test for this by observing your horse's flanks. If they look caved in, he is probably dehydrated. 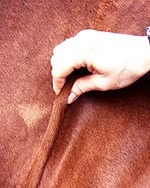 Pick up a pinch of skin along your horse's neck. If the skin snaps back quickly the horse is sufficiently hydrated. If the pinched area collapses slowly the horse is dehydrated. Keep your horse as cool as you can; make use of any available shade, as well as breezes or fans. Stand your horse in a pond or stream if it is available. If not, sponge or spray the large blood vessels along the inside of the legs and belly with cool water. Offer sips of cool, not cold, water.